Mail on Sunday saw a ludicrous feature on Extinction Rebellion, they were deluded, they wished to take us back to a fossil free dark age. No, they recognise we face a Climate Emergency, that a fossil free future is our only future. London, key points were taken. It was not until the third day BBC started to report. Police have been deployed to arrest peaceful protesters. Would they not be better deployed to deal with knife crime? Arresting people is pointless, and on dodgy legal grounds. For every person arrested, two more take their place. Nothing learnt from Civil Rights protests in US. Arresting people, more take to the streets. In Algeria and Sudan, the people have taken to the streets, faced down oppression, kicked two brutal dictators out of office. In Lincoln, on Day 4, a small gathering under a tree in the High Street. Were they there days before, I do not know. XRLincolnshire are here on Waterloo bridge. 200 police came to Parliament Square to take down our blockades, but they were all back up by morning! One ignorant man shouted abuse, hit out at the disruption in London. That disruption is as nothing when London floods due to rising sea levels. Extinction Rebellion have taken direct action as a last resort, for far too long our corrupt politicians have been in the pocket of big business, giving the go ahead to fracking, to Heathrow expansion, subsidies to oil industry, go ahead for open cast mining. Direct action is the only action that has ever changed anything. But there is hope. Especially since the policies we need to address the #ClimateEmergency are positive policies that would improve our lives in so many ways ….. It will cost far more not to address climate change to sit back and do nothing. Protesters in Lincoln were calling on Lincoln City Council to declare a Climate Emergency, as many councils already have, to halt the Western Growth Corridor. Activists need to seize control of the local Town Hall, to end the one-party state in the pocket of the local coop and big business, follow the example of Madrid, Barcelona and A Coruña, open to public participation, network across Europe with other citizen-controlled Town Halls. Lincoln and Lincolnshire have an appalling bus service. Try getting a bus to anywhere after 1900 in the evening. The pedestrianised High Street is not. Lorries drive through any time of the day. No enforcement action, local council and police turn a blind eye. There is a ban between 1000 and 1600, but no one takes a blind bit of notice. Maybe they will, but the protesters should have sat down on High Bridge and blocked the High Street. Ban wood burning stoves from the city. It beggars belief we still build new build with no solar panels on the roof. We need local area power distribution networks, owned and controlled by the local community, into which feed renewables paid a fair price, consumers pay a fair price. Surplus generation fed to other local networks via a publicly owned National Grid. Any ‘profit’ either fed back into the system or used to fund local community projects. Electric cars provide a nighttime base load. Avoid any corporate chain coffee shops, enjoy specialty coffee served in glass or ceramic in an indie coffee shop. In Lincoln that would be Coffee Aroma or Madame Waffle. Reusable coffee cups glass Keep Cup or bamboo ecoffeecup address symptoms. The planning application for a drive-thru Costa must be opposed. No one who loves coffee would be seen dead in Costa. More traffic. At a time when we should be reducing our dependency on the car, an application for yet another drive-thru. Local Coop once again acting for corporate chains whilst at the same time destroying Sincil Street. Those who love coffee relax in Coffee Aroma or Madame Waffle with specialty coffee served in glass or ceramic. Brighton has Hisbe. Lincoln needs a zero waste store. An animal diet, apart from being nutritionally dense thus better for our health, is environmental sound, grass fed animals are part of the natural cycle, improving the soil acts as a carbon sink. We have to drastically reduce our emissions of carbon. The longer we delay, the deeper the cuts. Children are going on strike on Fridays. They question why their future is being destroyed. We need a Green New Deal. Hacks at failing local rags The Lincolnite and Lincolnshire Echo failed to cover the protest. It started Monday a week ago, awoke to a light covering of snow. It soon melted away. In Lincoln, bitterly cold, light flurries of snow, few people about, those that were were stocking up with food. I had intended to leave early, instead left late, after lunch at County Restaurant the afternoon in Madame Waffle. Tuesday the snow had arrived. Before breakfast a path cleared of snow. A day of dark clouds, bright sunshine, heavy snowfalls. Heavy snowfall, blizzard, and something I had never experienced before, whiteout. This would alternate with clear blue sky and sun shining. Subzero outside, and yet, was able to sit and relax in the conservatory, heated by the sun. Solar power though of no use. Looking out, I see solar panels covered in snow. Nothing moving, everyone snowed in. Wednesday, as Tuesday, heavy snow, several inches deep, before breakfast clearing the snow. No soonest cleared, within half an hour, at least an inch deep. Before lunch, once again clear the snow, now a couple of inches deep. As Tuesday, heavy snow, dark clouds, sunshine. Again possible to sit in the conservatory, minus three degrees outside, drops to minus seven. As Tuesday, heavy snowfall, blizzard, whiteout, which would alternate with clear blue sky and sun shining. Impossible to go out, sink into the snow. Farnborough two days in a row, record for colddest place, minus 11.9C. Warning, we are running out of gas. People should drop their temperature by a degree, will not notice, saves money, saves gas. If going out, turn down the thermostat by at least five degrees, then turn back up on return. We need large gas storage facilities. We had but was closed last year. That is what happens when privatise energy supply, lose energy security, no resilience in the system. Not possible to import from Europe, as pipes lack capacity, and even if possible, Europe colder than UK, thus need the gas. UK was powered by North Sea Gas. It was sold of on the cheap, now UK imports roughly half the gas it needs. Wind is providing as much energy as gas, but different usage. Industrial users of gas cannot be cut off, crash cool a kiln and cause tens of thousands of pounds worth of damage to the kiln. In Lincolnshire, at least 45 roads are closed, idiots who should not be out, are out in their cars no idea how to handle a car in the snow, get stuck then block the roads. Police call in the military they cannot cope. Thursday I managed to get out. To my surprise, many people are walking in the snow in Washingborough. I guess house bound and an opportunity to get out the house. I ask one man, is it worth walking to the local Coop? He says no, no bread, he has taken the last milk. As I thought, no deliveries and more people placing demand on local Coop. Slowly running out of food. Walking around the village, very cold, Arctic conditions, sub-zero with a gale blowing. There has been no snow all day. Friday again no snow. Manage to get out and walk to the local Coop. As I thought, very little stock, no bread, little in the way of vegetables, a small amount of milk. Again very cold with strong winds blowing. Saturday a little snow overnight, light covering of snow. One degree Celsius. It actually feels warm. Hop on the bus to Heighington. The Spar shop reasonably well stocked, actually able to get some bread, the butcher well stocked. Stock up with provisions. At least will not starve. In the afternoon a trip into Lincoln. One kind person has even cleared the bus stop. Walking to the bus stop and waiting for the bus, cold and damp, a breeze blowing, misty. Very bleak journey into Lincoln. The State of the Art Lincoln Central Bus Station colder than outside. Outside the entrance a couple of inches of slush, Lincoln City Council cannot be arsed to clear the snow. Sincil Street and High Street the same, slush covered streets. Traders pay enough in businesses rates, the least they can expect is the streets to be cleared of slush. More people out than I expected. Maybe Saturday, maybe first opportunity to get out of the house and into Lincoln. Stokes on High Bridge as always, empty, same for Cafe W at Waterstone’s. On the other hand Coffee Aroma busy and at Madame Waffle packed queuing at the door to get in. That is th difference good coffee makes. I take the opportunity to stock up with more provisions. Walking back to the bus station, I notice the slush melting, water gathers at the lowest point and flows, the newly installed drains not at the lowest point. Yet another design flaw for the newly opened Lincoln Central Bus Station that only opened last month. Sunday a few degrees above freezing, the snow starting to melt, very misty. It snows, and the country grinds to a halt, the trains do not run, those that do run, break down leaving people stranded for several hours, foolish people go out in the cars, clueless driving on snow. For the last decade winters have been mild. Temperatures of 10C, maybe drops to 5C, occasionally below zero. These mild winters have lulled the country into a false sense of security. The Arctic, zero degrees, at least twenty degrees warmer than it should be , strong winds circling the North Pole driving the cold air southward into Europe. What is a heat wave in the Arctic has panicked climate scientists, as what has been observed is way beyond their worst case scenarios for climate change. In the UK we throw away 2.5 billion disposable coffee cups every year. Often there are very simple things we can do … like relaxing in a coffee shop with a cup of coffee, not walking down the street with a takeaway cup in our hands. Simple things, when we all act, can change the world. If I go to a coffee shop, unless they know me, I am greeted with, to drink in or takeaway? I can just about understand a cappuccino in a takeaway cup, but a single origin V60, no way. I would not drink a good red wine in a disposable cup, I object to beer in a plastic glass, why would I wish to drink a single origin V60 in a takeaway cup? These takeaway cups are often referred to as paper cups. They are not, they have a plastic liner, and it is this plastic liner that makes them take a one way trip to incarceration or landfill, as they cannot be recycled. OK for the pedantic, maybe a couple of plants that can recycle, but, no one is going to take the effort to separate out, therefore for all practical purposes, cannot be recycled, and are therefore on a one way trip to landfill or incineration. That is a lot of disposable cups. One estimate puts the figure at 2.5 billion throwaway coffee cups every year in the UK. According to a recent article in fake-left Guardian, environment department Defra using 1400 disposable coffee cups every day. There can be no excuse for this, not when from their own internal canteens, nor for House of Commons or House of Lords. It also means it can easily be tackled. Bulk order KeepCups, sell to staff at a discount. Staff have to bring their own mugs or KeepCups if they wish to buy a drink. KeepCups with Defra logo together with a few words on recycling could be handed to visitors. Defra should look to the Bank of England. Staff were encouraged to either purchase a KeepCup or bring their own mug, for which they received a small discount of 10p. 10p was chosen as it was self-financing, cost neutral, it covered the actual cost of the disposable cup. The KeepCups have the Bank of England logo. Lush in Australia and New Zealand gave all their employees a KeepCup in vibrant Lush colours as a Christmas present. Disposable cups are lined with polyethylene and have a polystyrene lid, there is sufficient plastic in 28 disposable cups to make one small KeepCup. In 2009, Simon Lockrey from the Centre for Design at RMIT completed a Symapro Life Cycle Analysis which has independently verified KeepCup sustainability claims. Research by Canadian chemist Dr Martin Hocking found the break-even energy requirement to manufacture a reusable plastic cup versus a paper cup over a lifetime use was under 15 uses. A captive audience at Lush, Bank of England or Defra is relatively easy to eliminate the use of disposable cups, what of the passing trade in the street? Coffee shops have KeepCups on sale. I have seen the cheap plastic ones in Harris + Hoole and at FCB kiosk, the more expensive glass in Coffee Island flagship store in Covent Garden. I mention KeepCup, as they are the industry leaders. There are alternatives. I have seen a bamboo version of a KeepCup. I have yet to see anyone walk in a coffee shop and buy a KeepCup, let alone walk in and request a refill of their KeepCup. HuskeeCup made from coffee bean husks is unusual in that it is reusable and recyclable. If not made at country of origin, questionable environmental credentials, and even more questionable the husks are being sourced from Burma, a major human rights violator. The cups are around $10 each, not including a saucer. The coffee shop, it may have been a kiosk, that was offering a substantial discount, maybe half price, I asked were there any takers. I think a couple of takers, that was all. Ben, at Ben’s Records, pops to the adjacent coffee shop with a mug. Prior to Budget November 2017, it was suggested impose a levy of 5p on takeaway cups, cf 5p levy on plastic bags which has reduced use of plastic bags. It was not taken up. I doubt it would make a difference, not when the takeaway coffee is cheaper than drinking in. Tax has various functions, raising revenue, changing behaviour. The principle the polluter must pay be would be grounds for imposing a levy. Let us assume a tax on takeaway cups of 10p, levied on 2.5 billion throwaway coffee cups that would raise an annual £250 million, not a paltry sum. There are recyclable paper cups, that can be composted, but I do not see them in use. There is though a problem. If a few unlikely coincidences occur, I am on my way home, have coffee from a kiosk that serves coffee in a compostable paper cup, I have been to the market and can drop my cup in my bag with the fruit and vegetables, else where do I put the cup, and if I remember when I get home to remove from the bag with my fresh produce, then yes I can throw on my compost heap. But if not, if these happy but unlikely coincidences do not align, then what do I do with this cup? Throw it on the nearest waste bin. That is the dilemma most will face, what to do with the cup? It is unlikely to be composted, even though it could be. It will go into the waste stream with all the other non-recyclable cups. In Athens and Cyprus, it is the norm to see people drinking from a takeaway cup. The worst offenders are Coffee Island (Greek equivalent of Starbucks) and Coffee Berry, two chains which serve coffee in disposable cups. At Jamie’s Coffee at Gatwick Airport, Italian catering supply coffee served in takeaway cups. Personally I would not buy a coffee in a takeaway cup, I prefer to sit down and relax with a cup of coffee, not drink on the hoof, which I find uncivilised, apart from the very act of drinking out of a takeaway cup as opposed to a ceramic cup or from a glass. That is not to say I never. I will have a coffee from FCB kiosk at Guildford Station or the Small Batch kiosk outside Brighton Station or the little kiosk on the South Bank at the foot of Hungerford Bridge or Ethiopian Coffee Roasters on the South Bank Street Food Market, but only because these three kiosks and one stall serve excellent coffee, not because I wish to grab and go. Kaya has a narrow bar, barely wide enough to balance a cup, the ground slopes, pick the height that suits you. There are no seats. The coffee shop is long and narrow, with no room for seats. Stools outside to sit at the bar not possible as the ground slopes. I was the only one drinking out of a cup. All I saw were office workers, grabbing a takeaway coffee on their way home. Coffee shops must do do more. They could voluntarily refuse to serve coffee in a takeaway cup. Bar Nine does not serve coffee in takeaway cups. If you really need to take away your coffee and not sit and relax with your coffee, they will lend you a glass jar and trust you to return it on your next visit. Nova Gea serves fresh fruit juices in jars. Eden Cafe does not serve coffee in takeaway cups. It buys ceramic cups from local charity shops, the cost about the same as a takeaway cup, which customers can take away if they wish. I have seen beautiful china tea sets in a charity shop. I recommended to a local tea shop they bought them. Not for everyday use, for special occasions when groups come in to celebrate. We could turn the serving of coffee on its head, charge more for a takeaway coffee than if sit and relax with a coffee. This sounds impossible, pigs may fly, and yet Lemonjello’s Coffee do just that, charge more for a takeaway coffee. You pay for the cost of the takeaway cup, it is built into the price, it is not made explicit. Why not make it explicit? Why not separate out as airlines do with luggage? You pay for your seat, want to take luggage that is an additional charge. You pay for your coffee, want something to carry it away with, that is an extra charge. If I drink a coffee, I wish to sit down and relax in a coffee shop with my coffee in a ceramic cup, whether or not a saucer a moot point. If V60, Chemex or Japanese syphon, in a glass. I do not like carting stuff around, if had a KeepCup I would have to cart it around. Then I would leave it somewhere and lose it. Where I think a KeepCup comes into its own, is for office workers and shop workers who pop out for a takeaway coffee, then yes, they should be using a KeepCup. I like to post pictures of the coffee shops, the coffee served. But not on Instagram, they claim rights to the pictures, and Instagram not visible on twitter. What looks more photogenic, a takeaway cup or a ceramic cup or a glass? To put your image, logo, marketing crap on a disposable cup is to associate your message with trash, it is saying you are ephemeral, transient, worthless. But then is that not true of most marketing? One person using one paper coffee cup a day is the equivalent of a tree being cut down each year to produce those cups. Why do we not value the coffee we drink? If we would not dream of drinking wine out of a disposable cup, why do we treat coffee in this way? The only way this can be tackled, is to ban the use of disposable takeaway cups, coupled with information on why they are being banned. The takeaway cups are not the only waste coffee shops generate. What of the coffee grounds? These can be used on the garden, used in cakes. A couple of coffee shops, at my suggestion, have made the grounds available for people to take away. The take up has bordered on zero. 3fe recycles waste, compost bins, using waste milk, sources local food, chaff from the coffee roasting process is used by a local supplier to smoke bacon. Coffee grounds are used on their garden out the back, what they do not use, a local cress grower Littlecress uses, who then supplies them with cress. Steaming milk for a cappuccino wastes a lot of milk. 3fe use for making yogurt. Coffee industry, the speciality end, has quite rightly focused on the supply chain, traceability, transparency, quality, accountability, from farm, through roastery to the coffee shop and what is poured into our cup. We now must ask what happens, beyond the coffee shop. Underlying all this and more fundamental, is the grab it and go culture, pointless consumerism, a throw away culture. The consumer culture that keeps the economy afloat. Consumer junk passes from extraction to factory, six months in the home, then on its one way trip to incineration or landfill. Until that is tackled, we will have a problem, and not only limited to coffee cups. 4 Billion Starbucks To-Go Cups Thrown Away Each Year … Will Recyclable Cup Reduce This Waste? It was already hot by mid-morning. Noticeable so as I was working in the garden. 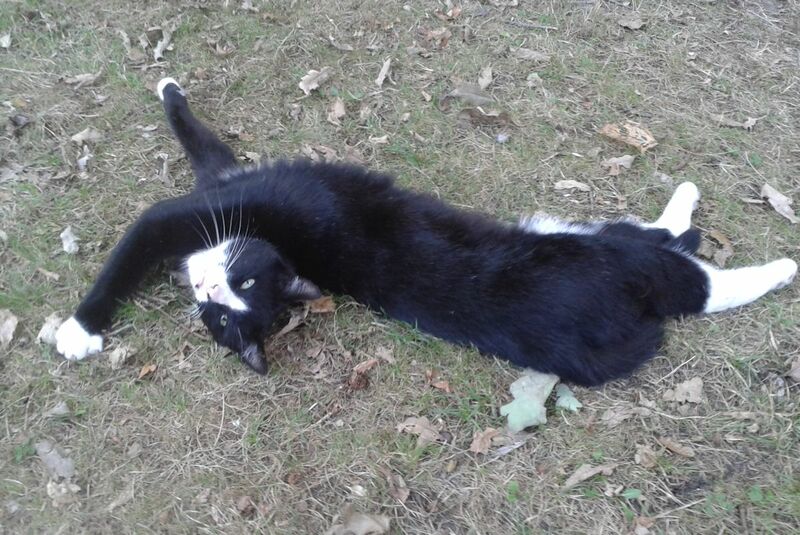 By early afternoon, Bob the Cat was stretched out trying to keep cool. 34.4C reached, hottest day of the year and hottest September day since 1911. 34.4C was recorded in Gravesend in Kent. Waddington in Lincolnshire saw ten hours of sunshine. Meanwhile in Manchester it was cool, thunderstorm, heavy rain and widespread flooding. Hinkley Point C will cost 18 billion euros. Correction, Hinkley Point C has an estimated cost of 18 billion euros. Large infrastructure projects have a nasty habit of being over time and over budget. This is true of EDF’s latest project in France. 18 billion euros is larger than the capital value of EDF. Major shareholder in EDF is the French government. If Hinkley Point C proves to be, as many suspect, a White Elephant, it will destroy the French government. The French Unions are oposed to Hinkley Point C and are considering mounting a legal challenge. The new UK government is having second thoughts. The price of electricity from Hinkley Point C is guaranteed for the next thirty-five years at double the current price of electricity. The price of electricity from renewables has been halving every 18 months. Hinkley Point C is a disaster and must be stopped. Proponents correctly say we need reliable sources of clean energy. That is why we must push ahead with renewables, the more we have, the more reliable, as not reliant upon the unreliability of a few sources. Also resilient. We must follow a Soft Energy Path, one wheres sources are matched to usage. Nuclear power is hard energy, it is also very brittle. Last week, my neighbour installed 14 solar panels on his south facing roof. Speaking to the contractors, they said peak output (on a good day when the sun is shining) is 3 kW. 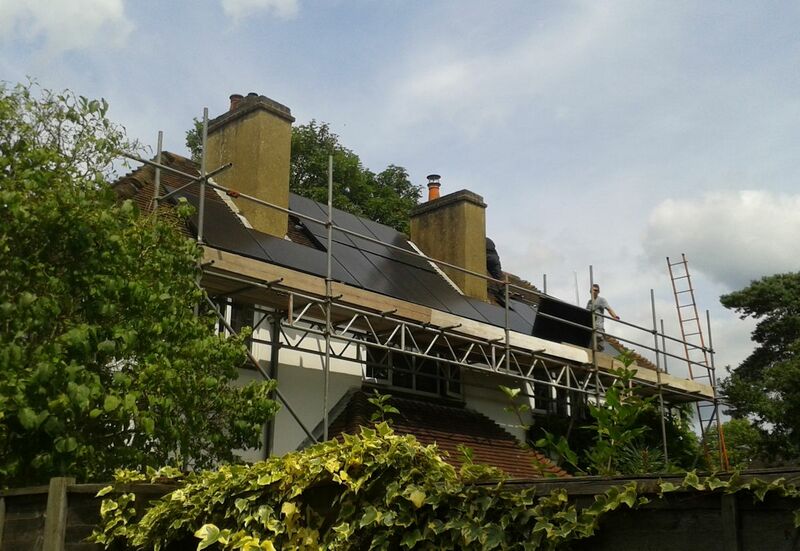 Imagine if every house had solar panels, if new build was mandatory to have solar panels. We need to create community owned local area grids. Into which feed renewables guaranteed a fair price. Consumers would pay a fair price. Any surplus energy would be fed to other local are grids via a publicly owned National Grid. Any monetary surplus would either be fed back into the local grid or used to finance community projects, watering of the collaborative commons. EU pushed diesel, thanks to lobbying by VW (the same VW that rigged emission tests). Net result nearly ten thousand deaths a year in London due to air pollution from toxic diesel. In US and Japan, a different route of hybrid and electric cars. Surplus generation, could be, at cheaper rate via smart meters, used to charge electric cars. Electric cars when not in use, with fully charged batteries, could be used when peak demand exceeds supply. Smart meters can also use the electricity for low grade heat, for example water heating and space heating, where being cut off for a short while does not impact on the user (especially if have manual override). A couple of weeks ago, a useless report on abuse by the Big Six, a useless report that cost millions to compile. A couple of their worthless recommendations was better use of price comparison sites (better called price fixing sites as paid by suppliers to set up deals) and if consumers had not recently change supplier, add them to a database to receive junk mail from suppliers. One measure at a stroke would improve the situation, eliminate standing charges, a fixed rate per kW-H, or maybe two rates, one a special cheap rate when surplus exceeds supply (requiring smart meters). There are no standing charges when paying for petrol, there should be no standing charges when buying electricity. We do not need to nationalise the Big Six, introduce community owned and controlled local grids, and the Big Six would be driven out of business, as unable to compete. Post-Brexit, we need investment in green infrastructure, investment in publicly owned railways, in locally owned and controlled electricity grids. What we do not need is bad infrastructure, HS2, Hinkley Point C, expansion of London City Airport or additional runways at Heathrow and Gatwick. Every two years, a jamboree for arms dealers, a showcase for the world’s most lethal killing machines, but portrayed as a fun day out for the family. Try telling that to families in Syria. For the local people and businesses in Farnborough, two weeks of noise, one week of gridlocked roads. F -35 peaked at 112 dBs. Day 1, a heavy downpour, nothing exceptional to what we have seen this year, but the Airshow could not cope. Exhibition halls flooded, loss of power, mass evacuation from the halls, Airshow closed early. Irony, aviation fastest growing source of greenhouse gases, airshow shut down by inclement weather. Those expecting lots of flying, would have been gravely disappointed. Very little flying, long gaps between. Red Arrows did a fly past, and that was it. No Lancaster or Battle of Britain fly pass. There was a flying fortress, it did a fly pass, and that was it. Normally, on Saturday and Sunday, it is packed outside The Swan at the end of the runway, best place for viewing, but this year few people. Airshow organisers showed their usual contempt for local people. No compensation for nuisances caused, but they could buy one ticket and get one half price. Buffet lunch at Gurkha Palace. I was surprised to find closes at three o’clock. The Swan once again ripping people off during Farnborough Airshow. A fiver to sit in the garden, £4-50 for a pint of beer. Three days of heavy torrential rain. In the mountains the rain falls as snow. 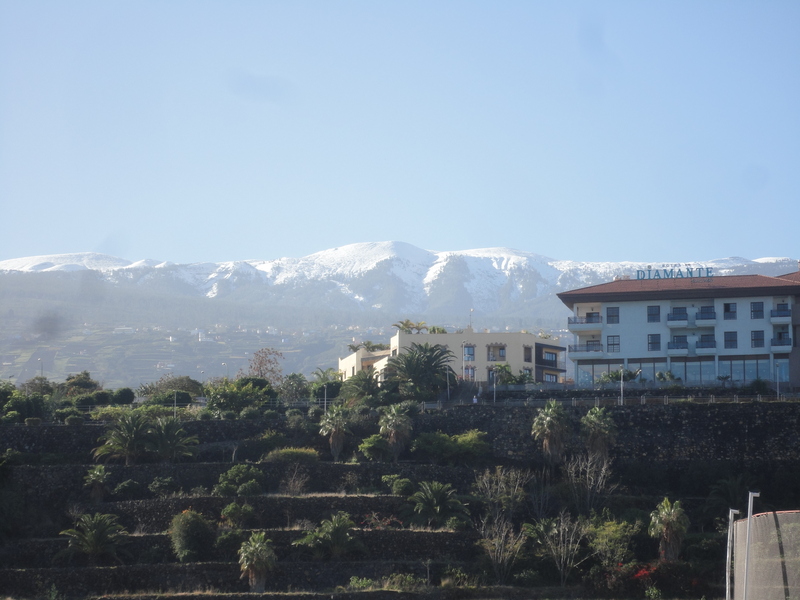 Snow not only covering El Teide, but also on the mountains surrounding Puerto de la Cruz. In England, nothing like this volume of rain, and yet widespread flooding. In Puerto de la Cruz, a stream in Barranco San Felipe ( a dry river valley), nothing more. 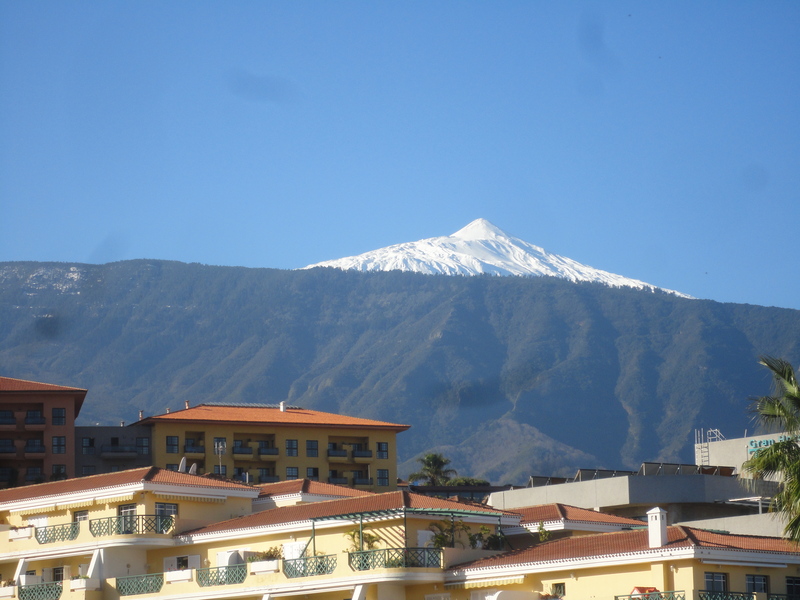 The reason the difference, hills in Tenerife covered in trees. All morning heavy torrential rain. 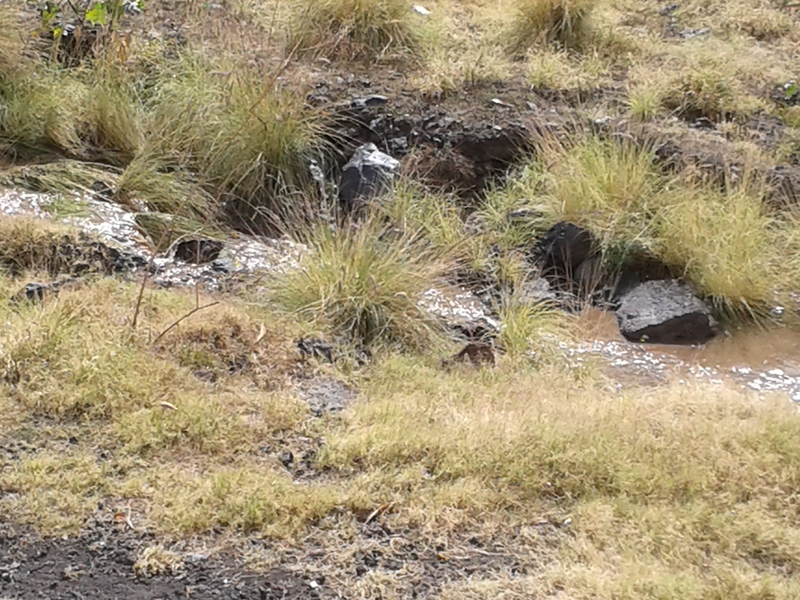 By lunchtime, a stream was flowing through Barranco San Felipe, a dry river valley. 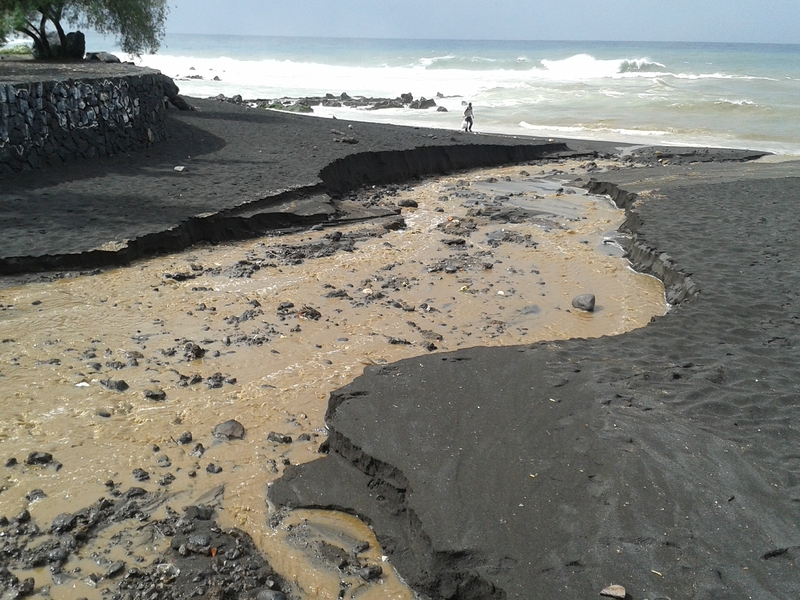 A gulley was carved out at Playa Jardín as the stream ran to the sea. The sea turned brown. Last weekend, one solitary daffodil out in flower. At a guess, in flower several days earlier. Since the weekend, several other daffodils in bud. Very early for daffodils. Usually towards the end of March. A few crocuses in flower. At the weekend, strong winds, even though there had been heavy rain overnight, meant the grass could be mowed, though it was still muddy underfoot. Since the weekend, grass spiked, a little every couple of days. Hard work. Today, as it was sunny, though hard frost earlier, more grass spiked. I would usually dig the ground. Not today, raked off the leaves, in went the peas. I would also have sowed the broad beans I picked up from Infinity Foods, but could not find them.